The above image is a view of the most recent Antarctic ozone hole, derived from NASA's satellite measurements that monitor the ozone layer. The larger the OZONE HOLE, the greater is the amount of the HEAT and Ultraviolet Rays from the Sun to enter the Earth's atmosphere. This abnormal situation increase the Temperature near the Ground Level (Global Warming) and decrease the Temperature high above in the atmosphere causing Climate Change Disasters. 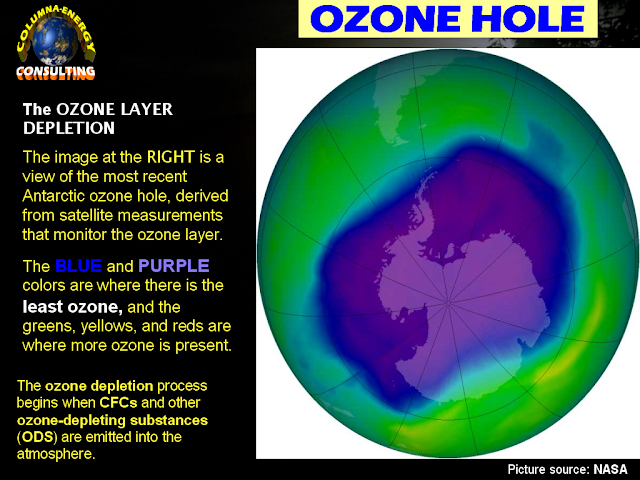 Ozone plays two different roles in the atmosphere. Placed near the ground, Ozone is bad and harmful; it is a pollutant caused by human activities. "BAD OZONE" is a major component of health-damaging smog. But, if you place ozone high above in the Stratosphere, the ozone becomes "GOOD OZONE" and acts as a shield, filtering out most of the ultraviolet rays from the Sun that is harmful to people, animals, and plants. The Ozone Layer acts to protect life on Earth by blocking harmful ultraviolet rays from the sun. The OZONE HOLE is a severe depletion of the ozone layer high above Antarctica. It is primarily caused by MAN-MADE compounds (particularly the refrigerant Freon) that release chlorine and bromine gases in the Stratosphere. Near the Ground, Ozone became a Greenhouse Gas, and so are CFCs. This means that their presence in the Troposphere contributes to the heightened greenhouse effect. But the MAIN GREENHOUSE GAS responsible for the current Global Warming problem is Carbon Dioxide (CO2). The main sources of this CO2 came from the burning of fossil fuels for electricity, heating, cooking, and transportation. In addition, oceans and soils release CO2 as they are overheated. The Earth's layers of atmosphere differ in chemical composition and temperature. They combine to create a protective shield that maintains our delicate energy balance essential for life on Earth. Most weather occurs in the nearest layer, the Troposphere (0-7 miles). The Stratosphere is the level where jet airliners fly and the ozone layer resides (7-30 miles). Beyond that is the coldest part of the atmosphere, the Mesosphere where only large helium balloons fly (30-50 miles). Finally, the Thermosphere gradually fades into space (50-180 miles). High up in the atmosphere, the loss of stratospheric ozone caused some cooling in that layer of the atmosphere. A much larger effect comes from carbon dioxide, which acts as a cooling agent in the stratosphere, while it warms the atmosphere close to ground level. This paradox happens because the atmosphere becomes thin as you go up. This change the way carbon dioxide molecules absorb and release heat. Together, the increase in carbon dioxide and the loss of ozone layer caused the record-low temperatures in the stratosphere and still higher up in the thermosphere. This cooling is not good, and it is another sign that increasing levels of carbon dioxide are changing our Earth’s Climate. Continued on: The GLOBAL CLIMATE CHANGE DISASTER AT THE TIME OF NOAH: A Grim Warning To Everyone, Especially To Climate Change Deniers And Messianic Kabbalah Mockers (1Corinthians 10:11-12, Isaiah 28:22)! Or, proceed to: MAN'S DISOBEDIENCE AND BREAKAGE OF GOD'S MARRIAGE COVENANT WEAKENS THE EARTH'S PROTECTIVE MAGNETIC FIELD. This Allows The Entry of Intense Heat and Radiation From The Sun Causing Climate Change Disasters, Earthquakes, And Volcanic Eruptions! regularly. I'm slightly sure I will be told a lot of new stuff right here!